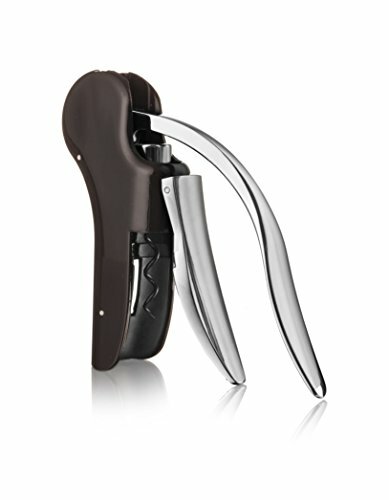 Vacu Vin Vertical Lever Corkscrew has two vertical gripping handles that latch onto the top of a wine bottle and a top handle that drives the corkscrew into the cork using a ratchet and quickly removes it. With a beautiful bronze finish and its easy-to-use simplicity, it is ideal for gift giving. Vacu Vin was established as a company in 1986 in order to manufacture and distribute the Wine Saver Pump and Vacuum Bottle Stoppers. The idea for the product emanated directly from the taste of spoiled wine - something that its inventors wanted to prevent once a bottle had been opened. The Vacu Vin Wine Saver was the first device of its kind that was available to the international market. It is now used in over 35 million households and more than 80 countries throughout the world. The award-winning device has been repeatedly imitated by numerous other manufacturers, but the Vacu Vin Wine Saver is still recognized as the market leader. Thus began the Vacu Vin range of wine accessories.